Same as last week I'm using Chris Townsend as an inspiration for this weeks picture, as he followed up with a picture of A Wild Sea On Islay. The picture above was taken during a visit to Islay in early/mid September 2000, where it had been comparably windy for a few days. Nowhere near a proper autumn or winter storm, but windy enough to generate a nice swell and waves breaking over the rocks and cliffs. This was just north of Portnahaven on the shore between Portnahaven and Claddach (the wave power station is behind the rocks in the distance). There were a few kids using the opportunity the waves brought: They climbed on some of the rocks and let the waves break over them. He's very difficult to see, but you might be able to make out a second boy on the picture, just ‘taking a shower’. 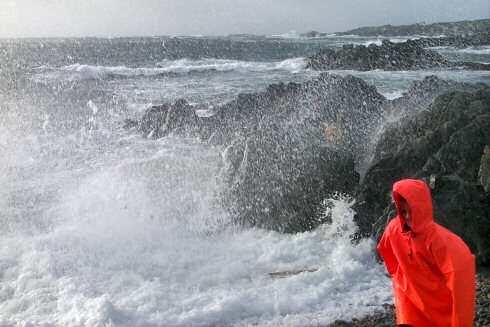 He's wearing a blue top over yellow trousers, standing in the rocks just up and to the left of the boys in the red jacket's head. Nature's wild playground a lot of children don't really get any more in the big cities. Have a great weekend, hopefully sunny and calm for now!